Make an impact with an easy-to-assemble, eye-catching 20ft inline display. Our wide array of 20ft wide off-the-shelf display types ensure that you will find the perfect solution for your needs - simple to sophisticated. All displays are paired with state-of-the-art graphics to add a contemporary and eye-catching message. 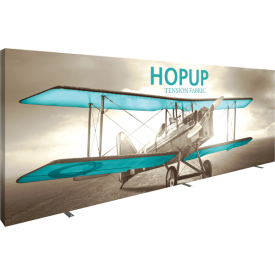 Fast, collapsible 20ft wide displays offer strength, reliability, speed and style. 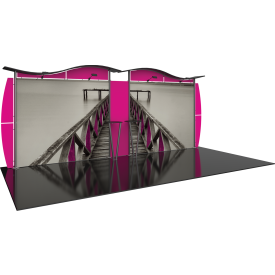 Collapsible exhibits include the Hopup™ line of popular, fast displays, the Embrace™ line of push-fit fabric collapsible displays, the Xclaim™ line of dimensional fabric popup displays and the traditional style Coyote™ popup display system. Each line has unique features, graphic attachment and assembly requirements. With such excellent options to choose from, it is easy to determine the best collapsible display for the use, need and budget. 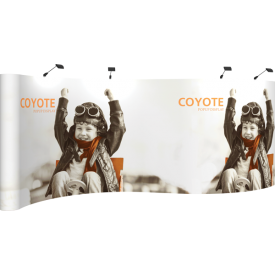 Make a stunning impression with Formulate® fabric 20ft inline displays. Available in Essential, Master, Modulate™ and Designer collections, these ergonomically designed 20ft tubular inline displays are lightweight, highly portable and are easy to assemble with the use of push-button or spigot connectors and zipper pillowcase fabric graphics. Straight, Horizontal Curved and Vertical Curved options are available, and displays easily create an impactful and sophisticated display, and satisfy any desire for style. 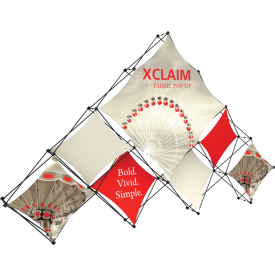 Modulate reconfigurable kits re-work into multiple inline sizes, helping to maximize exhibit value. Accents such as counters, kiosks, iPad stands and architectural accents and more add function and style to the exhibits! Find your easy-to-assemble 20ft inline display today! Sophisticated, modern and unique displays are in demand for those looking to stand out from the rest! The wide ranging line of modular exhibits use standardized aluminum or steel components as building blocks, and can often be reconfigured to fit multiple size spaces, or customized for any need. 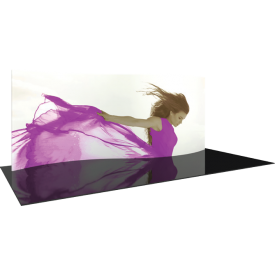 Vector Frame™ 20ft inline kits combine silicone edge (SEG) push-fit fabric graphics and aluminum extrusions; these displays are simple, contemporary, and easy to assemble. 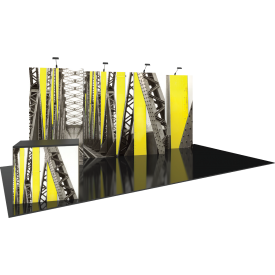 Hybrid Pro™ Modular 20ft inline exhibits combine aluminum extrusion frames with push-fit fabric graphics. Accents such as slot walls, illuminated walls, monitor mounts, literature racks, display lighting and more add function and style to the exhibits. 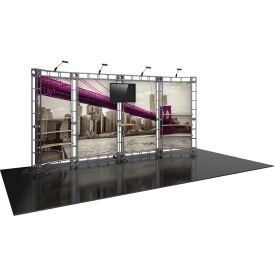 Bold and contemporary, Orbital Express™ Truss 20ft inline exhibits feature a fixed number of parts and connectors, and easily assemble with no tools necessary. Linear™ Pro Modular 20ft inline displays combine extrusion frames, Velcro-applied fabric graphics and accessories to make an impact on any show floor. Fabric graphic canopies and rigid header and wing graphics add style and attract attention. Each line has unique features, graphic attachment and assembly requirements. 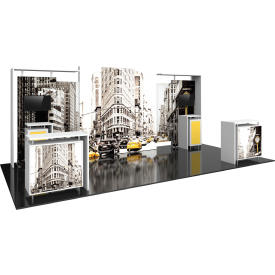 With such excellent options to choose from, it is easy to determine the best modular exhibit system to create a sophisticated and lasting impression. © 2019 Nimlok. All Rights Reserved.